For this session we are focusing playing forward and supporting the forward pass. The session is set up within an area approx 30-40 in Length by 25-30 Width. It is 4v4 in the middle with 2 players from each team at each end. Depending on how long the session is played for, players switch from the outside to the inside. The session is set up as within the previous session, but with the inclusion of 2 goals, 1 up each end. The players on the outside are positioned either side of the goal. A goal is scored when the ball is played to an outside player and then played back into an inside player to score into the goal. The ball must be played by the player receiving the ball immediately into the goal and cannot be passed to someone else (2 touch). See Diagram 3. • The player who plays a pass into the end player cannot receive directly from that player. Another player must receive the ball. • Introduction with 2 goals. Outside players are in the middle and goals either side. The teams have 2 goals to score in. See Diagram 4. Former First Team Coach of Championship team Fulham FC. Sean is a UEFA A Coach with a Masters in Sport Coaching. He has over 15 years of experience working in professional football from Academy through to First team in the Premiership and Championship. For this session we are focusing on a finishing session; receiving the ball from 4 different areas in order to finish on goal. The session takes place in around the in around the penalty area. Players include: 1x GK / 4 x servers / 1 x attacking player. The players serving and attacking will rotate. The attacking player has 4x finishes on goal (max 2 touch per finish). Ball 1: Attacking players starts goal side of the pole / marker. Played on the angle to receive on the back foot and finish with the right food. Ball 2: As with ball 1, but on the left foot. Ball 3: Attacking player gets goal side of the pole, a ball is played from the central server to the wide player who takes a touch past the pole to then deliver a ball into the middle. Ball 4: As with ball 3 but on the other side. The 2nd part of the session continues from the previous finishing session, but for this part of the session we have included a defender. The starting position for the defender is just a few yards off the attacking player. They can make their movement as the ball is played from the servers. For this session we are focusing on challenging the players with an under load in possession as oppose to an overload. Challenging the players to maintain possession under pressure, managing the ball individual, creating passing and goal scoring opportunities. Former First Team Coach of Championship side Fulham FC. Sean is a UEFA A Coach with a Masters in Sport Coaching. He has over 15 years of experience working in professional football from Academy through to First team in the Premiership and Championship. This session focuses on forward runs, breaking the lines to create goal-scoring opportunities. The ability to successfully control a ball during a receiving or dribbling action is crucial to meet individual and team tactical agendas. This activity aids the player to practice a first touch into a vacant space action and to follow it up with a dribbling change of direction activity. Pair of red cones 1 yd. away from each other. A pair of blue cones located left and right 5 yards away from the pair of red cones. One yellow cone located 7 yds. above each pair of red cones (see diagram below). Total Activity Time: 10 minutes. Activity Repetitions: 10 repetitions for each player. Time of Activity Repetition per player: 30 seconds. Technique: Different receiving, dribbling, and passing variation patterns at moderately high ball speed. Players are placed into pairs. Each pair goes to a passing station. Each passing station includes a pair of red cones one yd. away from each other. One yellow cone located 7 yds. above each pair of red cones. To start, the player on the black cone will pass to the teammate at the red cones. The player in black will play a first touch (punch the ball) in between the red cones. Then a dribbling action in between the two blue cones. Once this is accomplished, the player will change directions and quickly dribble to the yellow cone go around it and make a pass to the teammate (see diagram below). Once the ball is passed to the teammate, the yellow player will make a run to the starting space and perform the activity on the other side. Each player repeats and performs the activity five times for 30 seconds with these variations. If variation is needed, then the routine may be performed with corporal restrictions. Hands extended straight up into the air. Make sure to practice receiving with different foot surfaces and to complete first touch and dribbling accuracy in between and around the cones. Always alert and on their toes, focus is key. Current Seattle Sounders Academy Performance Coach with previous European academy coaching experience as an assistant fitness and strength/conditioning soccer coach with Levante U.D. (2013-2014) and Getafe SAD CF (2015-2016) in Valencia and Madrid, Spain respectively. A USSF “A” licensed coach with a BSc in Physical Education and an MSc in Sports Training and Nutrition. • There is no one way to perform a technical execution. • No action will ever be the same. However, via individual biomechanical subjective actions, predominant passing and receiving technical executions will be performed by an athlete and mimicked more than others. Therefore, each player has a predominant reactional playing habit or neuromuscular behavioral pattern that is typically executed and in theory observed more than others. To summarize, the scenario and tactical decision-making action will dictate a technical action to solve the soccer specific scenarios in a match or competitive practice setting. Therefore, adding variations in already learned technical execution patterns is important for player improvement to further solve in game situations. • Area Size: Pair of red cones 1 yd. away from each other – blue cone located 3 yd. away from red cones. • Total Activity Time: 20 minutes. • Activity Repetitions: 20 repetitions for each player. • Time of Activity Repetition per player: 30 seconds. • Intensity: Low to Moderate. • Technique: Different passing and receiving variation patterns at moderately high ball speed. • Players are placed into pairs. • Each pair goes to a passing station. • Each passing station includes a pair of red cones one yd. away from each other. • A blue cone is placed three yards away from the red paired cones. • See below diagram for setup. • To start, the player at the blue cone will pass to the teammate at the red cones. • The objective for the player at the red cones will be to receive the ball and slightly punch the ball between the red cones. • Once the ball goes in between the red cones, the player will quickly shift to the other side of the red cones and quickly pass the ball back to his teammate. • The player at the red cones will now be on the other side of the cones and will repeat the same action on each side of the red cones. 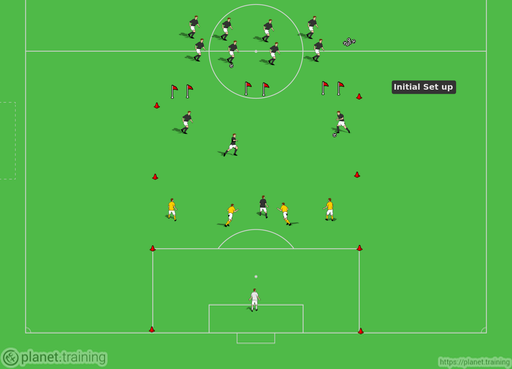 • Each player repeats and performs the activity five times for 30 seconds with these variations. o Hands behind the back. o Hands behind the head. o Hands extended straight up into the air. 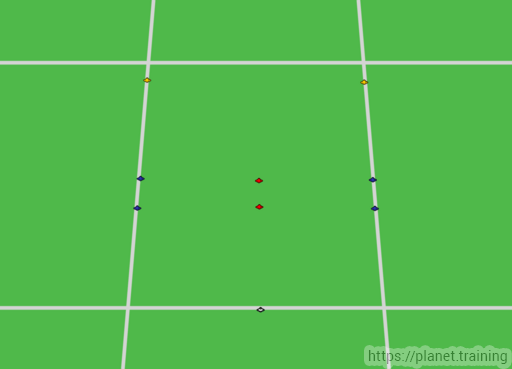 • To start, one player will have the ball and will stay central and between the paired cones. 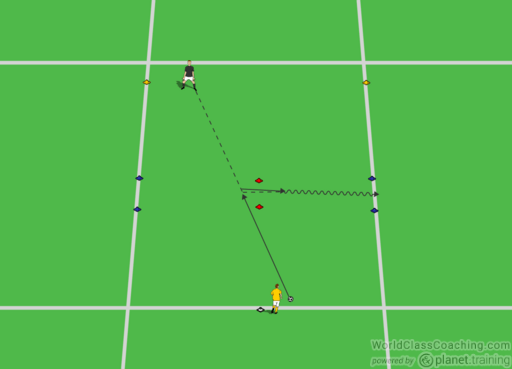 • The objective for the other teammate is to one time pass the ball back at the left, in between and the right side of the paired cones (as seen below). Set Up: Area 30×20 divided into 4 rectangle areas (15×10). 4V4 + 4. See Diagram 1 below for the set up of the players. The attackers are the players in black. The defenders are in yellow. You can adjust the size based on your players age and skill level. 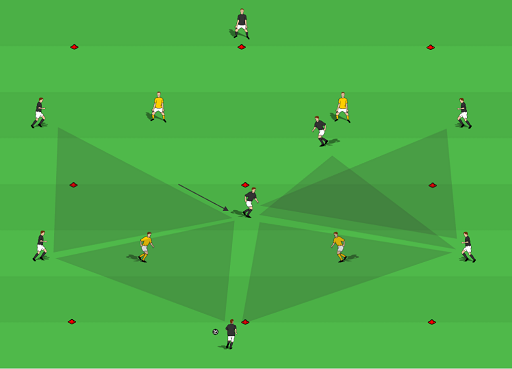 The Drill: The two black players in the middle (the central midfielders) can move in all four rectangles but must not occupy the same rectangle at the same time. There is 1 defender per rectangle. The players on the outside can move along the full length of their designated line. The position of the players mimics a 4-4-2 formation, minus one center back and one forward. Black Team (Attackers): Maintain positions and possession of the ball with the emphasis on going forward from Centre Back to Forward (from the bottom of Diagram 1 to the top), rotating through the middle and utilizing passing options of support players, creating diamond and triangle shapes. These players look to create passing options (triangles and diamonds) in wide areas to penetrate and advance forwards. Yellow Team (Defenders): If possession is won, there are two options. Either play to the bottom player in black (center back) as quickly as possible, which replicates a counter attack in a game, or maintain possession 4 vs 2 in the central area (see below in Diagram 5. The center mids have to work hard in attack and then also work hard in defense to quickly win the ball back. Competition: For the offense of 8, 10 passes is a point. If the defense steals the ball and manages to make 5 passes in the 4 v 2 in the middle, they score a point. Of course, you can adjust this number based on the age and skill level of your players. When the attackers have success, add the condition that the defenders can move freely instead of staying in their rectangle. Allow the wide “midfielder to go inside when the ball is in their half, also allowing the wide “fullbacks” to move up. Use rotation to create attacking overloads higher up the pitch, through overlapping and inverted runs. Gregg Gillies is a nationally licensed coach through the USSF and is a Youth Athlete Development Specialist and Head Coach at Mount Laurel United Soccer Club, where he currently coaches a u14 girls team, the MLU Raptors. He also is the owner of www.NoLimitsSoccerTraining.com, where his focus is on maximizing a player’s individual technical skills, soccer IQ, and overall athletic development. Set Up: Size (dependent on strength and skill of your players) at least 8-10 players plus GK (in the progression). 6 player set up, as seen in diagram 1 below. Have at least 8, with an extra player behind Player #1 and Player #4. If you have more than 8, you can put players behind any of the other spots. As seen in Diagram 1, you can use mannequins for the middle players to check away from and receive passes. You can also simply use corner flags or cones. Players #1 and #4 each start with a ball. Players #5, 6 and 1 mirror players 2, 3, and 4 below. For the players to understand how this fits into a game, these can be either backs or midfielders. Player #1 plays to Player #2 (this is like a fullback playing to an outside midfielder if that helps your players visualize). Player #3 starts at the manniquin and checks back into open space to support Player #2 when the ball is received. Player #3 opens up, let’s the bal roll across the body and takes the first touch with the left foot. Player #4 checks back to support and receive a pass from Player #3 (this pass should be with the right foot). The sequence starts again with Player #4 playing up the field to Player #5 the same way Player #1 passed to Player #2. Player #5 is in the Player #2 role and Player #6 is in the Player #3 role. Depending on the skill level of your players, you may initially perform this drill with only one ball, starting at Player #1. Once they understand the drill and absorb the important details, such as checking into space, you can start with a ball at Player #4 and Player #1. Each player follows their pass. Diagram 2 shows the completion of the passing sequence. Progression: Diagram 3 and Diagram 4 adds a fourth player to the mix. Now you’re working with a backline or midfield that has four players. The drill continues in the same manner. The central player needs to start next to the manniquin (or cone) and drop into the support space to receive the pass facing forward. In the diagrams above, this would mean opening up and receiving with the left foot and then passing with the right foot. When the central player takes that first touch, the outside player needs to drop back, open up their body and also take their first touch facing forward. Make sure the players open up, receive with the proper foot and pass with the proper foot. In going left to right, the receiving touch should be with the left foot and the pass should be with the right foot. The details are very important in a drill like this. The timing of the checks into space, the quality of the first touch, as well as the correct foot, the accuracy of the passes, as well as which foot makes the pass. Opem up and receive with the back foot. Switch direction of the drill. Now the first touch is with the right foot and the pass is with the left foot. The next progressio is to make this drill more functional by going in one direction and adding crossing and finishing as well. There will also need to be a goalie. Now the four players involved are facing a goal and they will switch the field from one side to the other before the outside player dribbles down the line and crosses the ball. As you can see in Diagram 5 the ball goes across the field to the outside midfielder who dribbles forward, changes direction back, and plays a backwards pass to a supporting central midfielder. This midfielder plays the ball to the other central midfielder who completes the switch by playing out wide to the other outside midfielder. This player dribbles foward to the corner and crosses the ball for a teammate to run onto. When the first outside mid dribbles forward (in diagram 5 this is the right outside midfielder), the other players move forward with him, just as in a game. When the outside mid makes his cut with the ball (as if protecting the ball from a defender), the inside midfielder needs to check back into a good support position to receive the pass. Be sure and switch the direction so crosses come from both sides of the field. As you can see in Diagram 6 below, the other midfielders all make specific runs. The two central midfielders cross each other with one going near post and the other going far post. The outside mid makes a late run for any cross that comes all the way through or over the central players.